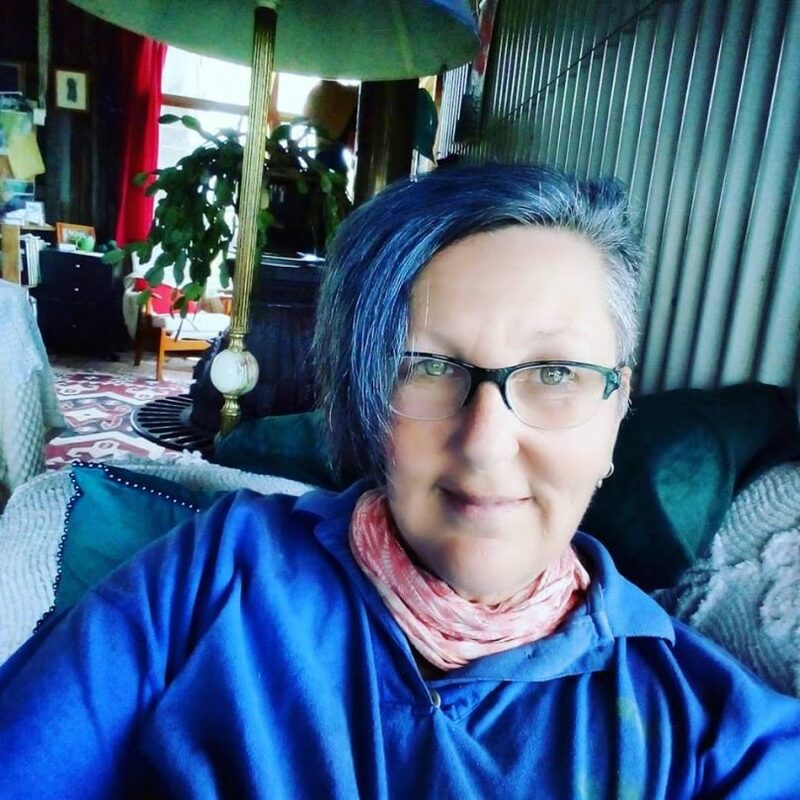 Kathleen McCann, getting beyond the blue. Photo: Kathleen McCann. Editors note: Today marks the one year anniversary of the Reedy Swamp, Vimy Ridge, and Tathra Bushfire. Sixty-five homes were lost on the day and sharing stories from that day has proven to be much needed and effective. The Stories of March 18 group recently hosted a writing workshop and Kathleen McCann went along. Thanks for sharing this with us Kathleen. It was such a hot start that day, March 18, 2018. I had already managed my Summer crops through some pretty dry weather. My tomatoes didn’t happen and my small stone-fruit trees didn’t set much fruit that year. My tamarillos were loving it though – of course, they are subtropical plants, so they were loving the heat. I am at Tanja, a small community just 7kms north of Tathra and I am a firefighter with the local Rural Fire Service brigade. I was feeling extremely vigilant that day and had woken early to begin watering my garden and making sure my animals were doing okay. It was around midday that I noticed the smoke plume, it looked like it was coming from the top of Dr George Mountain Road. I kept an eye on it as I ate lunch, but it was growing. No alerts were coming through, but I made the decision to go down to the fireshed anyway, just in case. That was around 2:30 and I wasn’t the only one there. My other brigade members started to turn up too. By 3:15 we were on our way into Tathra. 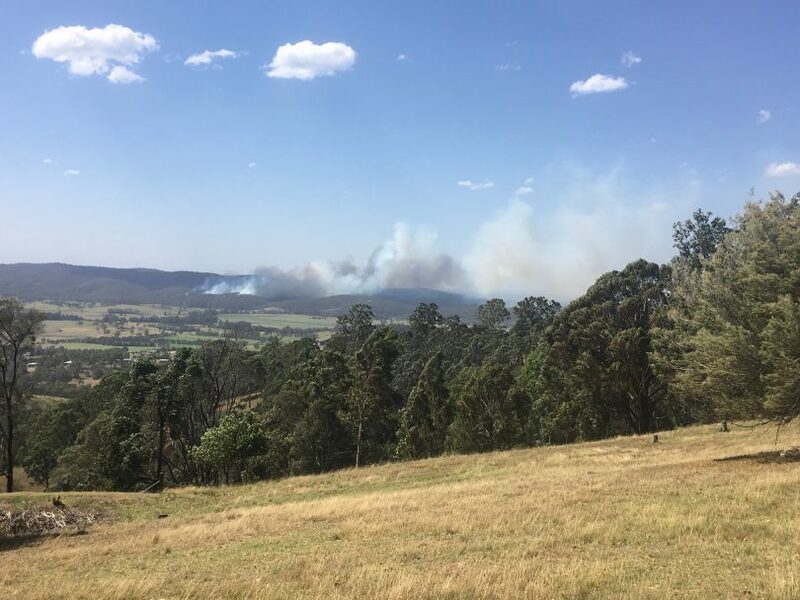 The early stages of the March 18, 2018 bushfire that destroyed 65 homes, as seen from Black Range, Tathra sits behind the smoke plume and mountain range. Photo: Ian Campbell. I was not prepared, really, for the ensuing firestorm that hit Tathra, but our small crew of four got stuck in as best we could. It’s an experience I hope to never have to face again. It was heartbreaking to watch the houses of people whom I know and love, disappear into a blackened mess in such a short time. All we could do was save what we could, so many spot fires, so much ember attack, all through the thick pall of choking, acrid smoke. The air was full of noise – exploding tanks, water bombing choppers, and planes. Fire trucks of all sizes, lights flashing, moving carefully around and between the many brigades who were coming up to the hydrants to refill; moving up and down the streets. By 9:30 that night, our crew was relieved by another team from Tanja brigade. We went home but none of us got any sleep. It was an intense time for so many people in and around that fire. I came away with a case of PTSD, but thankfully I am fully supported by the RFS, with excellent help available when I was ready to take it on. But I was pretty shook up. My life had changed. 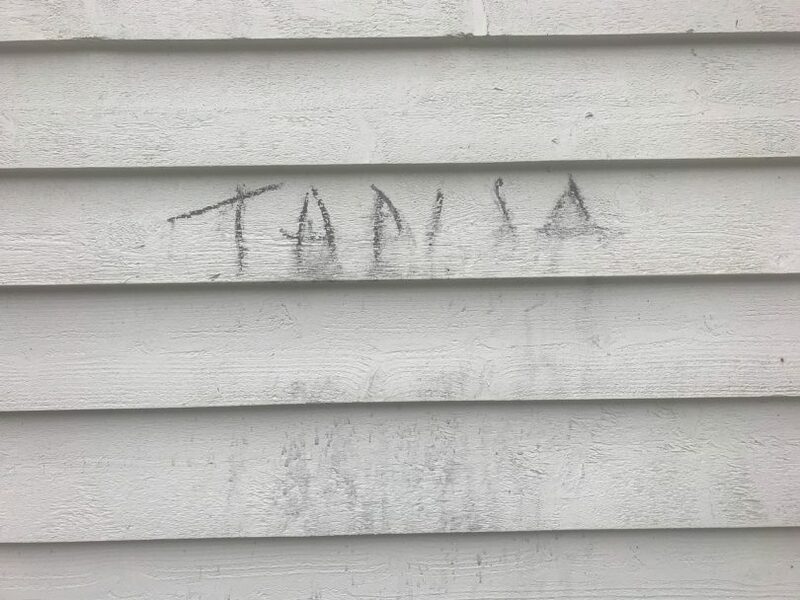 One of the houses saved by the Tanja RFS, leaving their mark in more ways than one. Photo: Hamish Payne. My garden became my solace. Each day I found myself out there, sometimes just sitting, watching, having a cuppa, talking to the chickens, watching the small birds and insects enjoy what they could find flower-wise. The next few months became a bit of a mission out there in my garden. 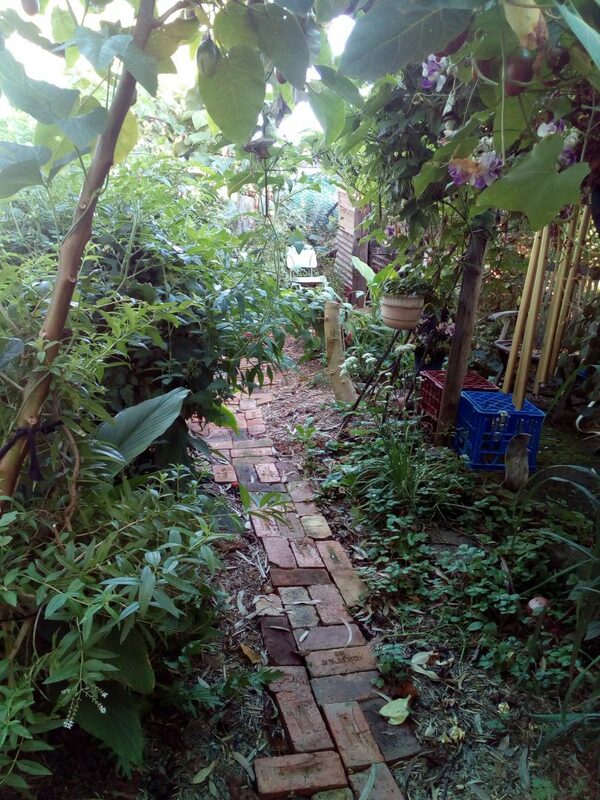 The bricks lying around the back of the shed became a meandering brick path. I collected a huge amount of manure from the nearby horse paddocks. I heavily mulched everywhere to save water throughout the dry Winter months ahead. I added more subtropical plants too, the climate is getting warmer, so why not give it a go? In only a space that’s about six metres by seven metres square, there are four avocadoes, one macadamia, two plums, one early peach, one pear, two tamarillos, and one elderberry, they’re my big trees. Below them are the small shrubs or trees, one lemon tree, one birds eye chili (it’s now 3 years old! ), lemongrass, lemon verbena, and bergamot. In the Summer of 2019, we’ve had a lot of warm rainy weather. 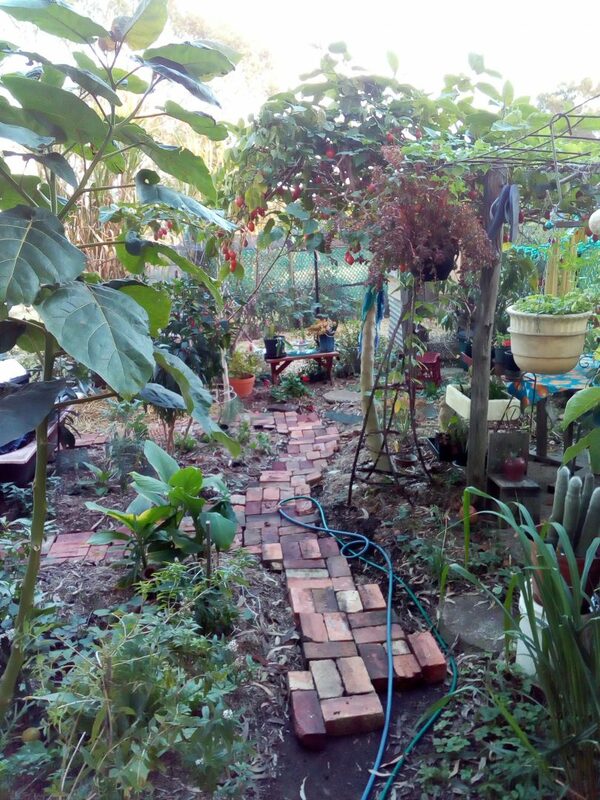 Around all my trees I’ve grown tomatoes, capsicums, eggplants, lots of different greens – herbs like basil, parsley, and chives. Sunflowers are holding up bean vines, silverbeet flourishes in a new sunny spot, carrots, and beetroot are coming on and a pumpkin is growing up one of the plums. Kathleen’s garden March 2019. Photo: Kathleen McCann. While my garden grows, I’m getting regular help from my psychologist. He recommended I look at the difference in my garden from then to now. As you can see, a lot has changed. Change and growth in me as well – my garden has helped me see that. We have both made it through the most challenging of years. South East NSW Primary Health Network/Coordinare – free counselling is available, visit their website to find a local provider or call 4474 8410. Original Article published by Kathleen McCann on About Regional.